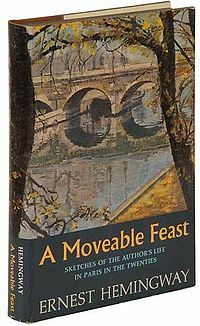 There are two versions of A Moveable Feast, which was a series of unorganized memoir-essays intended for a book at the author’s death. The first version (1964) was put together by Mary Hemingway, his 4th and last wife. The second edition, (“Restored” – 2009) was edited by Sean Hemingway, Ernest’s grandson, and removes unflattering remarks about his grandmother as well as a few other differences. The book covers the period that the Ernest and his first wife, Hadley, speng in Paris, 1921-1925. It was apparently a wonderful time. Hemingway presents himself as being just lovely but it would seem everyone else has a LOT of problems, except Hadley. Hemingway writes little essays about time spent with Gertrude Stein, Ezra Pound, Ford Maddox Ford, John Dos Passos, F. Scott Fitzgerald and others.